This statistic ranks the 15 countries with the highest military spending in 2017. With defense spending totaling USD 610 billion, the USA ranked first. The United States lead the globe in military spending in 2017. China ranked second in spending, as it has done since 2008. With military outlays totaling 590 billion US dollars, the US spent about 35 percent of the total global military spending that year, 1.68 trillion US dollars. 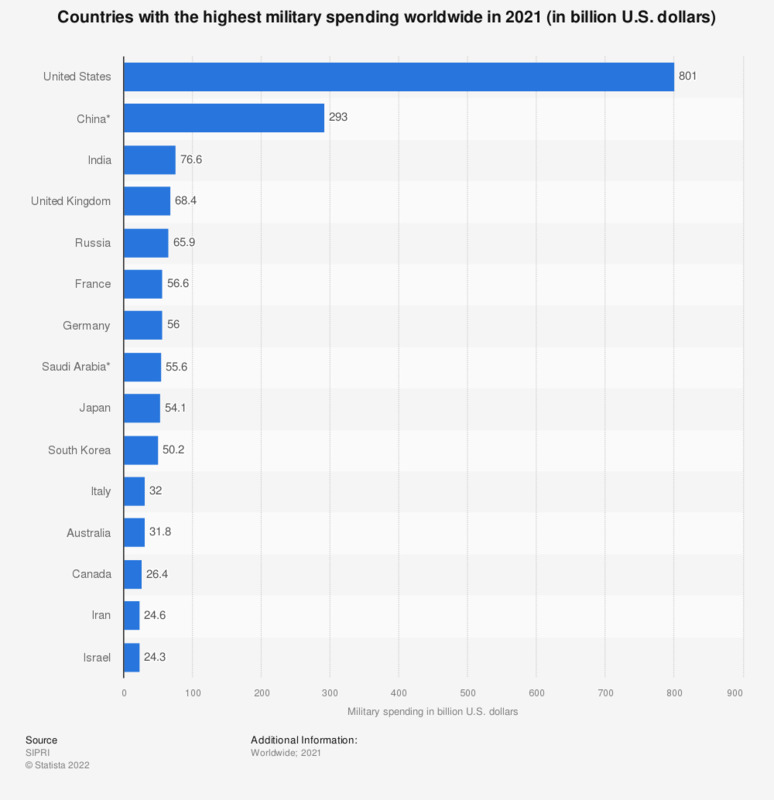 In 2016, United States military expenditure amounted to 3.3 percent of US gross domestic product (GDP), placing the U.S. lower in national military expenditure as a percentage of GDP to Russia, which spent 5.3 percent of its GDP, and Saudi Arabia, which spent 10 percent of its GDP. The 2012 outlay value, 670.5 billion US dollars, represents the first fall in US defense outlays in over a decade. In 2011, the United States spent 699.8 billion US dollars on defense, up from 689 billion US dollars spent on defense in 2010. The decline in 2012 is the result of austerity measures taken in response to the global financial crisis and post-Iraq/Afghanistan military operations. In 2012, US war costs in Iraq fell drastically from 47.4 billion US dollars (in 2011) to just 10.10 billion U.S. dollars. Spending on the War in Afghanistan fell from 122 billion US dollars in 2011 to 111 billion US dollars in 2012. Nonetheless, America’s basic defense budget remains primarily unchanged. According to the US Congressional Budget Office, US outlays for defense will rise from a low of 625 billion US dollars in 2014, to 734 billion US dollars by 2022. Between 2013 and 2022, it is projected that the United States will spend 392 billion US dollars on nuclear weapons, 97 billion on missile defenses and 100 billion on environmental and health costs. Global military spending, meanwhile, has grown steadily since 2001, when 1.15 trillion US dollars were spent globally, to the 1.68 trillion US dollars spent globally in 2015. Despite the global financial and economic crisis, nations did not curb military spending in the ‘00s and the beginning of the ‘10s. Going forward, global defense spendingis estimated to increase in all regions between 2010 and 2020. Before the end of the decade, spending in Asia Pacific is projected to have increased by 165 percent since 2010, by 94 percent in the Middle East and Africa, and by 49 percent in Latin America. * According to the source, the data derives from estimates. Spending figures are in U.S. dollars, at current prices and exchange rates.